Emirates Airlines announced this week that it will launch the first ever scheduled A380 service to Moscow from December 1, replacing the Boeing 777-300ER. Spread over two decks, the 517-seat A380 features 427 seats in Economy Class, 76 mini-pods in Business Class and 14 First Class Private Suites. The aircraft also features an Onboard Lounge on the upper deck for First and Business Class travelers, which opens once the plane has reached cruising altitude. There are also two Onboard Shower Spas available exclusively to First Class passengers. For all passengers, the A380 features more than 1000 channels of in-flight entertainment and gourmet-chef prepared cuisine. “We know travelers from Russia have been able to enjoy the Emirates’ A380 when traveling from Dubai to destinations such as Bangkok, Sydney and Johannesburg. Now we are bringing our flagship aircraft to the Russian market so more travelers can experience this magnificent aircraft,” said Obaidalla. 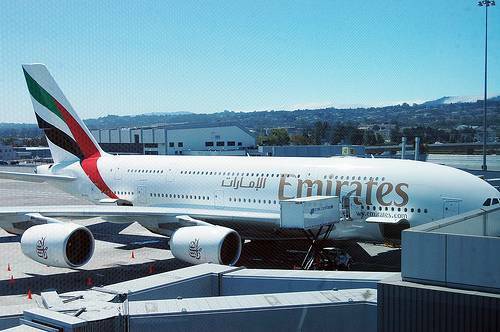 The flights on the A380 will begin from December 1 from Dubai.